Join us at Lanier Islands in Buford as we honor and remember Georgia’s Fallen Soldiers who have been lost while fighting in the wars in Iraq and Afghanistan. As always all race proceeds benefit charities created in memory of a Fallen Georgia Soldier. 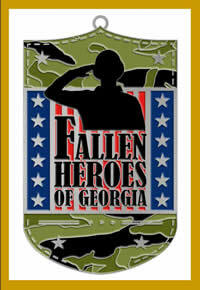 First 2,000 participants to register will receive a Fallen Heroes of Georgia Finishers Medal so REGISTER TODAY ! A sneak peak of the artwork will be posted soon! * Late registrants will have the chance to buy a race tee shirt on race day for $10.00, while supplies last. Take advantage of our new referral program, powered by RunSignUp, and raceFREE! This applies to anyone who registers online with RunSignUp. Register and go to your confirmation email for an easy to find link. Share your link with your friends by email, messaging or on Facebook. Once 5 of your friends register with the use of your link, well then your card is credited with the cost of yourWIN WIN! HELP us grow this race, please SHARE TODAY! Reserve your race tee today by registering for the April 27th race. Shirts will only be given to participants or sold at the race on April 27th. Let's make these final two years of tribute be the highest attendance yet! Each year we have 1,300-1,600 participants, but thesetwo years let's see if we can have at least 2,000 runners or walkers out in support. 2. Then click on 'Interested or Going', and lastly but most importantly share the event with your Facebook world. 3. THANK YOU ALL FOR YOUR HELP AND CONTINUED SUPPORT! A big THANK YOU to the Home Depot of Hamilton Mill in Dacula for donating an 18 volt Milwaukee sliding compound miter saw valued at $499.00! To be eligible to win, just register to walk or run in the FHOG 5K, and maybe you'll take home this top of the line Milwaukee miter saw. 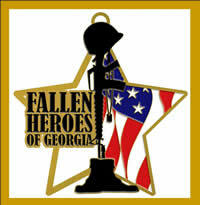 Fallen Heroes of Georgia, Inc.- Is a nonprofit that raises funds to support charities created in memory of a Fallen Georgia Soldier, and NO members of Fallen Heroes of Georgia are paid for their time or efforts. 9 and under, 10-14, 15-19, 20-24, 25-29, 30-34, 35-39, 40-44, 45-49, 50-54, 55-59, 60-64, 65-69, 70+. First park in the Grand Hall Pavilion lot. Race bib and shirt pick-up will be located in the Upper Beach Parking Area. The parking area is near the intersection of Camellia Lane at Islands Parkway. The race will be held atLanier Islands, located at 7000 Lanier Islands Parkway (formerly Holiday Road), Buford, GA 30518. We recommend that all registrants arrive at the Resort to 1 - 1 ¼ hours before the start of the race. This is due to the delays that can occur when entering the Resort, passing the gate with possible volume related delays, parking, race bib and shirt pick up, walking back and forth to your vehicle to drop off race tee, brief opening ceremony, and lastly to be in place for a timely start of the race. Enter the resort, go over the bridge, go left around the ‘Clock Tower’ roundabout, in 4/10 of a mile turn left on Camellia Lane, and then right into the Grand Hall Pavilion parking area. Well placed signs will direct drivers to the parking area. Race bib and shirt pick-up will be located in the Upper Beach parking area, which is located across Islands Parkway and uphill into the Upper Beach parking area. Begins at 7:40am, so please arrive early to hear Pastor Bob Mahan’s message fromHamilton Mill Christian Church. Then Pat Felt’s perfect rendition of the National Anthem. 1. This will work strictly on the ‘Honor System’. 2. Slower runners and walkers please keep to the right. 3. Avoid running in groups of 3-4 runners wide, these groups are often difficult for others to pass. This is especially important in the first mile of the race. 4. Be advised that your own race timing will start as you first cross the starting mats, and finish after crossing the finishing mats. Can family come with me in support? Yes, but please stay near the start/finish area. Are dogs allowed? No, dogs leave droppings and dogs can bite. Are Strollers allowed? ONLY WALKERS WILL BE ALLOWED TO USE STROLLERS! Do I have to pay a gate fee? Yes, starting in 2017 each vehicle will pay a $6.00 parking fee at the gate. Can I sell my number? No, because the disclaimer is in the registrant's name. Can I have a refund? No, sorry no refunds. Will there be daycare or kids related activities? No, please bring a caregiver. This exhibit was at the 2014 race !